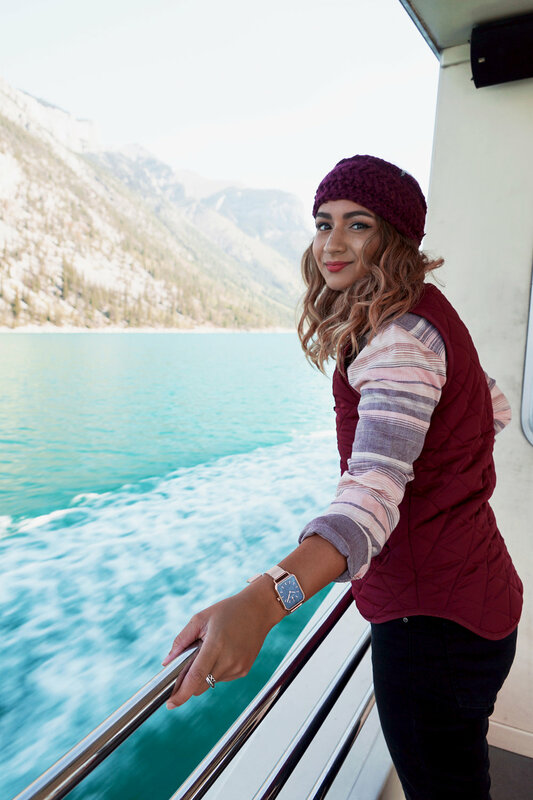 This post is not a usual one for Postcards from Hawaii but I wanted the opportunity to combine an itinerary with my photoshoot for David David in the Canadian Rockies. We shot in four locations: Lake Minnewanka, Banff Gondola, Sulphur Mountain and Moraine Lake. Read on to find out more about what we did at these locations, ticket costs and how long each excursion takes. We began our day with a boat tour on Lake Minnewanka. The air was cool and crisp (as you can see from my goosebumps) and the water was a brighter shade of blue than the sky, in turn complimenting the playful stripes of blue and white on the Time Square candy striped wrist strap. Lake Minnewanka is a 13 mile long glacial lake that is a whopping 466ft deep. Boat rentals are available here but the best way to learn about the “Lake of the water spirits” is to take the guided boat tour where you will be educated on the rich history and legends surrounding the lake. The tour costs $56 CAD per adult, $28 per child aged 6-15 and is free for children aged 5 and under. It is approximately one hour long. 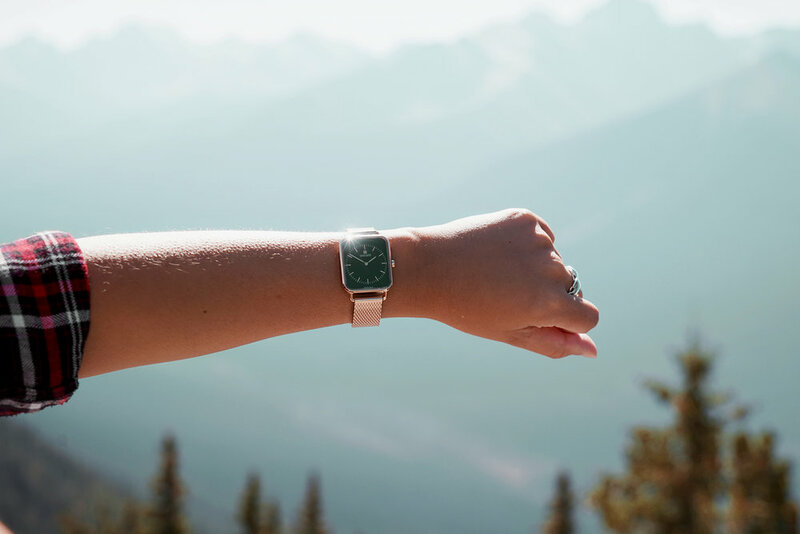 Just as it does in the mountains, the weather changed in an instant as the midday sun graced the summit warming the air and bouncing light off the luxurious rose gold strap of Time Square mesh strap so that it shimmers in a way that you just can’t keep your eyes off it. Accessed by the Banff Gondola, the views from Sulphur mountain are mind-blowing. From the top you’ll be able to see Bow Valley and six mountain ranges. For the best view that doesn’t require too much effort in terms of walking, take the boardwalk up to Sanson’s Peak where you can learn all about Canada’s first national park and the man who walked up to the top once a week for 30 years to check the weather, stopping at the incredible age of 84! Tickets for the gondola return journey cost $58 CAD per adult, $29 per child aged 6-15 and is free for children aged 5 and under. The gondola ride itself will take just under 10 minutes. It’s enclosed but the windows do open if you are brave enough to stick your camera out. 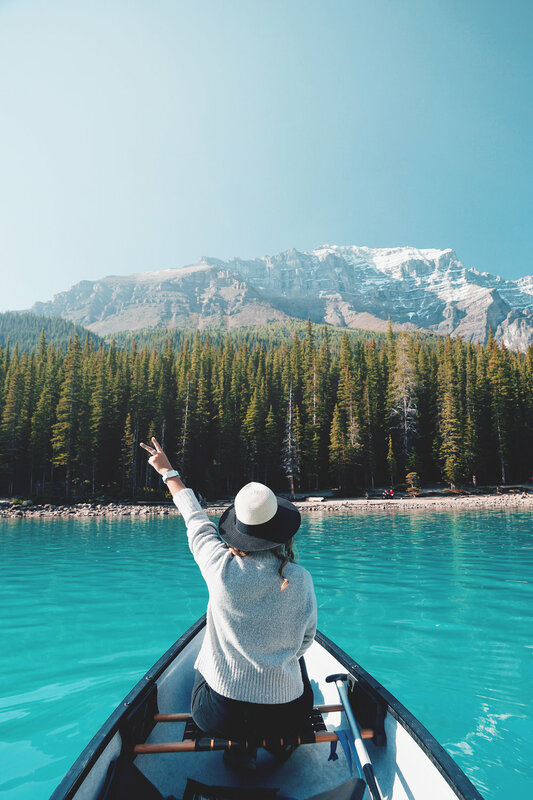 We finished the shoot with a final trip to Moraine Lake which was the only day we experienced glorious sunshine which brought the mind-blowing colour of the lake to a whole new level of appreciation for natural beauty. It was here that we got an incredible collection of focused product shots and photos that showcase the jaw dropping scenery in a way that makes you feel as though you’re seeing it with me. In my personal opinion, Moraine Lake is in the top three lakes of Banff/Jasper along with Lake Louise and Peyto. Its colour is so intense that it’s hard to take in that what you are seeing really exists, and when the sun comes out well, it really is something else. Getting to Moraine Lake will be your biggest challenge of the day. Our time in the Rockies began in the summer holidays and ended within term time so towards the end of our trip the lakes were drastically quieter and parking was significantly easier. It is recommend that you arrive to the car park before 7am or after 7pm and this advice should be taken very seriously. The car parks to the main lakes are very small and fill up well before 7am, past 7am the road to the car park closes and you are turned away either to take the shuttle service or continue your journey elsewhere. PFH Top Tip: If you aren’t feeling a crazy early morning, aim to be at road leading up to the car park for about 6.45am - I’m not making any promises that the road will be open, but even at the busiest time we were in by then - the road should be open but chances are the car park will be full. The first time we went we were in the car park at 7am with no spaces and a lot of car circling, defeated we headed back down to find the road had been closed to cars trying to enter. Quick thinking led us to turning around to head back to the car park. If no one could get in but people were leaving we would eventually get a space! That’s exactly what happened, we got to the top, waited no more than five minutes and got a space. This worked for us at least six times at various lakes. As I mentioned the lakes were much quieter once schools had gone back so we were able to get into Lake Moraine in the afternoon where we hopped on a canoe, went for a walk and stayed long enough to see the sun disappear behind the mountains. The canoes are heavily dependent on the weather and will close without notice if the wind picks up. They are run by the hotel, Moraine Lake Lodge, so if you are concerned about whether they are open you’re best bet is to go to reception to ask. From my personal experience where it took three tries before the canoes were open, reception is the only place you will get a straight answer. Canoes can be rented for $110.25 CAD per hour. 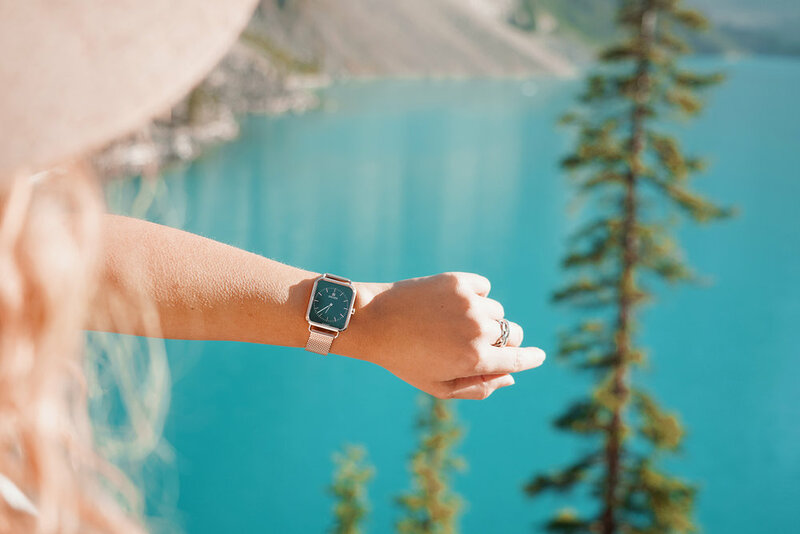 The two watches featured in this post are from a collaboration with David Daper, a Swiss watch company who live for travel and strive to create “a worldwide community sharing a common lifestyle outside of the mainstream”. Both watches are from their Time Square collection and are water resistant to 30m. To shop either of my watches head here. Subscribe here to stay up to date with new arrivals on Postcards from Hawaii.